Goldenrod, trees, rose, daisies, grass, weeds, abundance! Even as the days are now visibly waning, the wet season seems to not want to follow suit. 2018 has given many trials to food growers: a very cold late winter with almost no spring, followed by a hot and muggy summer that is runner up for Pennsylvania's wettest year on record. 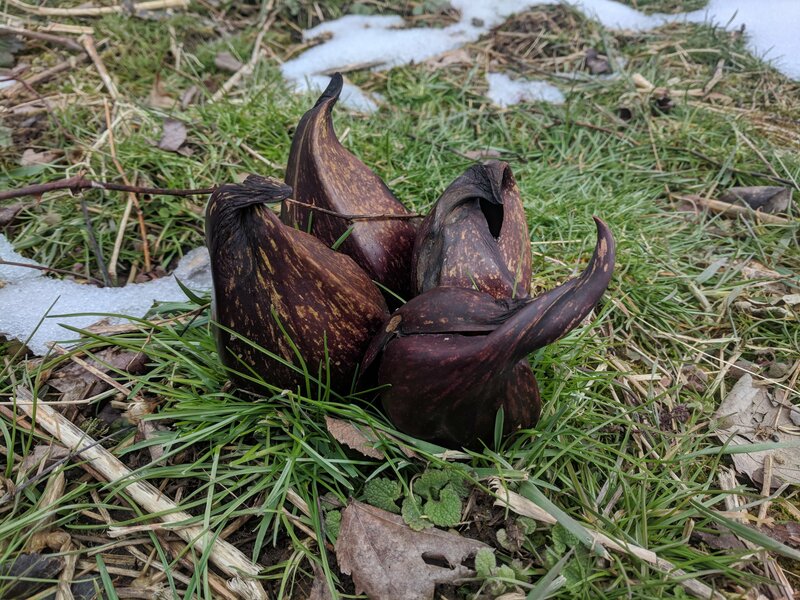 Despite this being bad for several of our garden plants, it's been quite the opposite in the pasture and forest. We've observed baby saplings, planted this past spring, fall and spring of '17, grow 6 to 9 ft! The pasture grass is the most healthy the cows and sheep have ever seen, and flooding has brought a tiny stream back to life that now meanders its way to the Little Chiques creek. In general all of the woody perennials and so-called "invasive" medicinals are thriving thanks to the abundance of rain. Even some of the annuals did well despite the elements and fungal rot that effected others. In the river hills we've eaten the sweet nectar of paw-paws like children leaving a sloppy mess all over faces and hands. Wild mushrooms such as chanterelles, boletes, chicken-of-the-woods, and oysters have been plentiful, their mycelial web decomposing dank wood, turning sick and dying to healthy earth. And, as we anticipate foraging black walnuts and hickories, acorns have been dropping upon us from the oaks above. So now as we celebrate the years harvests and prepare for the coming winter we begin to slow down and reflect on what's working and what isn't, balancing light and dark. We also give gratitude to the water that brings us life, and to you, our community. Our Farm Store is open! The little milkhouse just down our driveway by the bank barn has new life, with a fresh coat of paint and new lighting. The big chest freezer holds our pork, beef and lamb cuts for sale, and the refrigerator stores the pastured eggs and shiitake mushrooms. There is plenty of space left to add fruit, nuts, herbs and vegetables as we get our systems up and running! We are open Monday to Saturday, 8:00 am to 7:00 pm (call if you want to come on a Sunday - someone may be available). Fall Meat CSA Shares! What's a CSA? Community Supported Agriculture! When you become a member you are buying directly from your local farmer with no middle man. You will be supporting a local farm, one dedicated to regenerating the soil, the environment, and the ecological balance and diversity of your region. In return you get the convenience of doing about a months worth of pastured meat shopping in one day, receiving a box of diverse cuts. We have full and half shares throughout the year. With our fall shares you get to choose beef, pork and/or lamb, and are a monthly pick-up from October-December either here on our farm, the Horn Farm Center in Hellam, or our Lancaster city location. Click here for ordering instructions and more info! ORDER NOW! We now accept EBT/Snap cards! Onward to making healthy food more accessible to all! Rain can bring abundance. In the newly planted 5 acre pasture across the road from the farmhouse, trees, cover crops, and pig forage grew with abandon all year long. Two foot tall chestnut whips turned into 8 ft trees in one growing season. A summer cover crop mix of sorghum, clover, cowpea, radish, brassica, chicory and sunflowers grew above my head in a matter of months. Hazels, oaks, persimmons, and apples all turned a rich, deep green as they converted sunlight into leaves, wood, and roots. We could not have asked for a better growing season to turn this abused old cornfield into our forage wonderland we call "hog heaven." 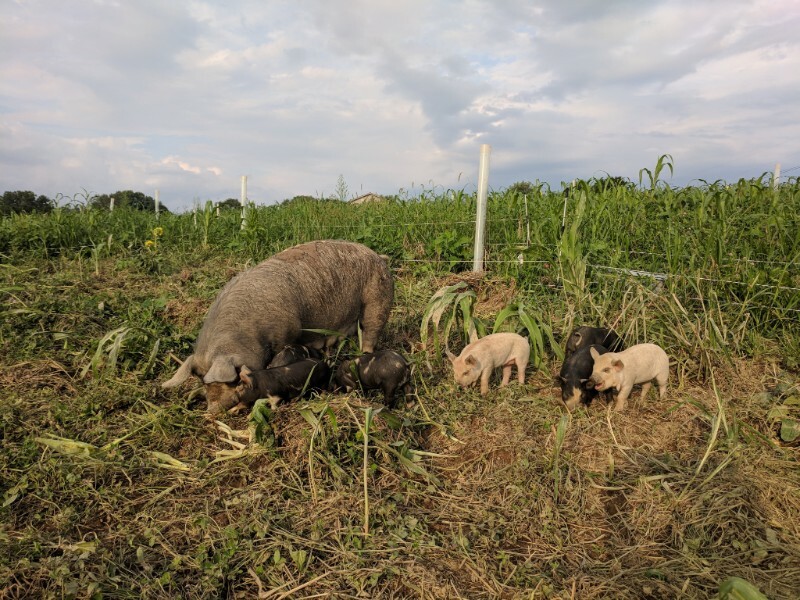 And we are grateful for it because the excellent growth of the forage helped our two first-time sows rear their full litters of 9 and 7 piglets, respectively, into healthy little tanks of porcine vigor (great job mamas!). 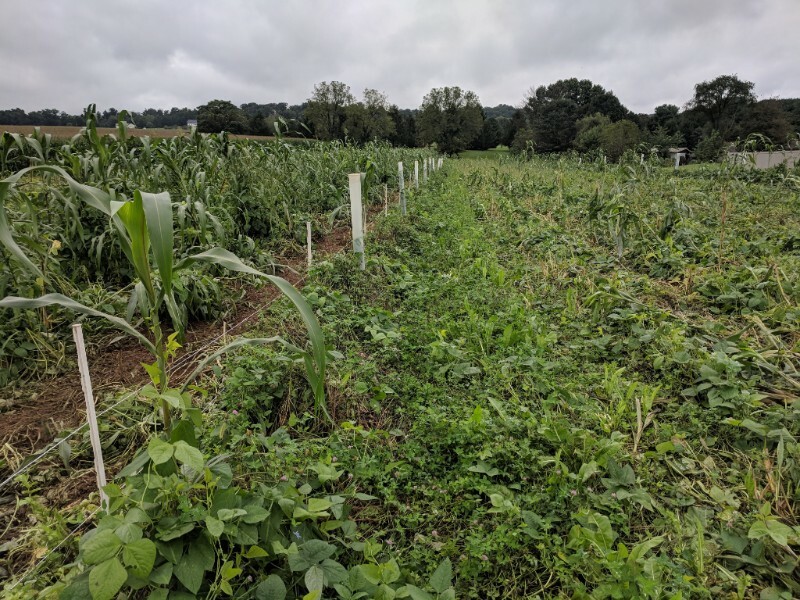 Once again, caring for the land and increasing plant diversity brought in butterflies, spiders, crickets, grasshoppers, bunnies, groundhogs, snakes, and more into this small plot of land that stood silent as a lifeless field of chemically-treated soybeans last year. No longer. 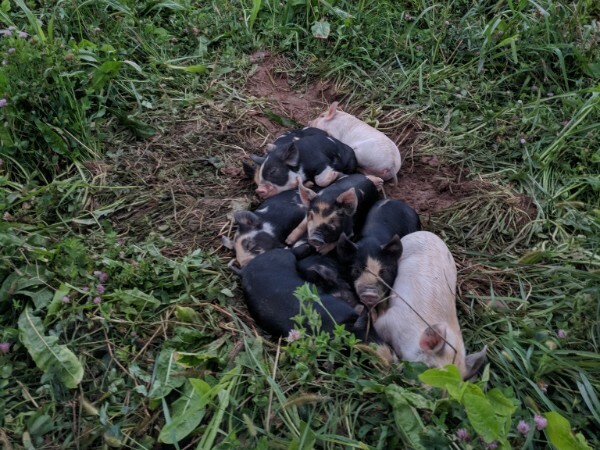 As the pigs forage, root, and turn the remaining plants back into the soil they prepare the ground for more diverse plantings of cover crops to be seeded. These mixtures will overwinter and build the soil anew until the pigs come back to graze and root next year. All the while, our trees will be growing and in a few years will begin to bear fruits and nuts that will feed us humans and the pigs will feast on the leftovers in their pastures. I can hardly wait for that moment when apples, mulberries, oaks, hazels, persimmons, and chestnuts are dropping their abundance, while the pigs are stretched out and napping under the trees with full bellies and silly grins from over-indulging on the fallen smorgasbord of food. If that isn't a picture of hog heaven I don't know what is. Soul Fire Farm is a small, black-led organic farm in New York that is creating huge change in the food system. 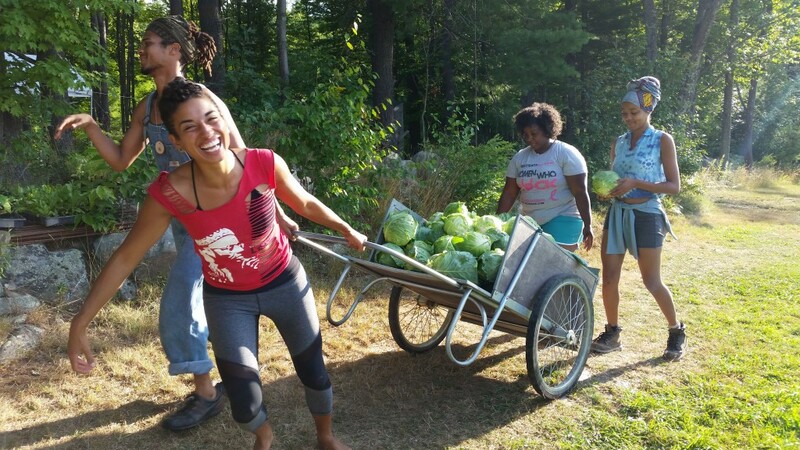 They are tackling food apartheid, climate change, racism in the food system, disconnection from land, harmful agricultural practices, lack of community, all while growing boatloads of life-giving food for their local community. They are also training the next generation of farmers, activists, and movers who are seeking to build community-based food systems that are equitable, grounded in the earth, regenerative, and open to all. Their websitewww.soulfirefarm.org has a wealth of information on how to take action in your daily life or where to press institutions for change to make food and farming a force for good in the world. Also, Leah Penniman, the executive director and author of the new book, Farming While Black, will be speaking at the Pennsylvania Association for Sustainable Agriculture (PASA) Conference in Lancaster this February, so mark your calendars! If you can, consider supporting the work of these amazing folks! Fall is the time for harvest, gratitude, and tying up the loose ends of the growing year. For us, that means autumn is also the season for slaughtering and butchering animals. We will have two workshops this November on how to butcher chickens and sheep from our farm. Join us and our good friend and butcher Javier to learn how to properly break down an animal into cuts, grind meat, and some suggestions on how to prepare different cuts of mutton. Go home with 12 lbs of grass-fed mutton from our farm! In the morning (8am) will be a demonstration on evisceration that folks are welcome to see and then the afternoon (1pm) will be hands-on butchering, grinding, and vac-sealing. Bring a lunch if you are coming for the morning to watch the gutting process. Email or call to reserve a spot, space is limited! Join us to learn how to slaughter, pluck, and gut a chicken so that it is ready for the table. Every attendee will have the opportunity to do the entire process themselves. Email or call to reserve a spot, space is limited! Note: these chickens are our older laying hens and are not suitable for frying or roasting but will make the best chicken soup you have ever eaten! 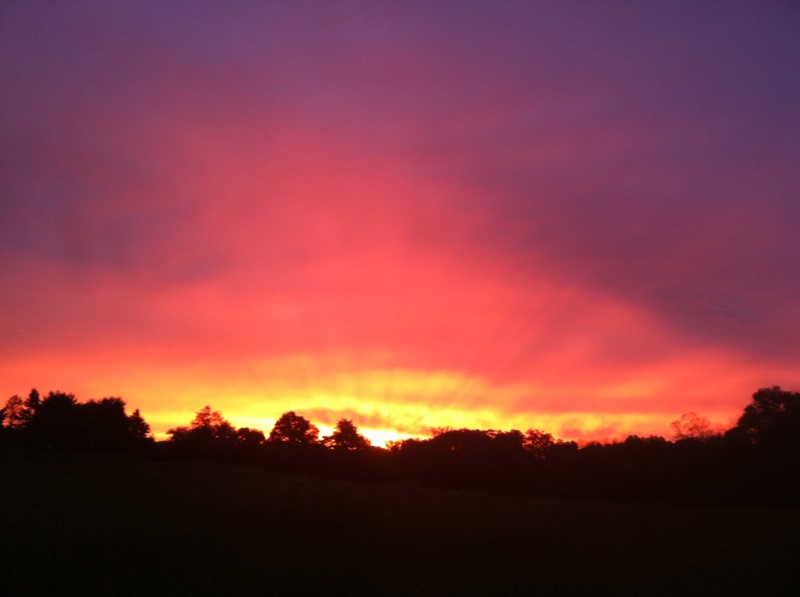 Summer solstice sunrise from the pasture! The final celebration of the days of growing light before the slow transition to winter darkness. Summer is the time for abundance, deep green plants, flowers turning to fruit, and all of the brilliance of life on full display. We see it in the large flushes of shiitake mushrooms after a deep soak of water, in the rows of black raspberries bent over with the weight of purple fruit, in the orchard where "weeds" are covered in honeybees drinking their heart's desire of nectar, and in the pasture where trees are stretching 3 ft higher in a little over a month of growth. We are feeling a great deal of gratitude for some of the abundance that we have helped to cultivate here and the abundance that occurs if you don't get too much in the way with nature. In the pasture, it has been a remarkable transition the last four years. 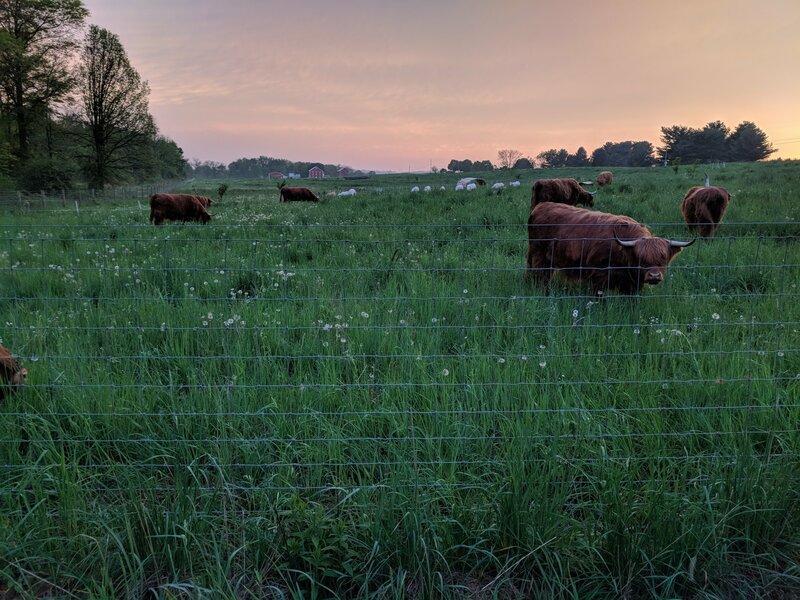 When we began grazing four years ago, our field was a yellow-green mix of sparse grasses and weeds, lacking in fertility and stressed from the 40 years prior of conventional tillage, monocropping and herbicide use. There really was not much life in the soil. Within a month from our start at grazing, dung beetles appeared and began to work the cow-pies in the field and transport all of that fertility down into the soil where it could be used to jumpstart the plants, fungi, insects and bacteria that call the soil home. The second year, the grass began to thicken and we did not have to mow weeds off as much. We also seeded some clover that begin to put more fertility in the soil due to its remarkable association with bacteria that converts nitrogen from thin air into usable plant fertilizer. In the third year, the pasture took off with a thick stand of clover, grass and newly planted trees (thanks to all of our helpers!) that probably doubled the total forage from when we started. And this year, the new benefit has been the growing presence of birds, especially tree swallows, in our pasture. Each day when we move the "flerd," dozens of tree and barn swallows swoop in and around our animals picking off flies mid-air and performing some impressive acrobatics. There are fewer total flies on our animals then ever before, the presence of birds means more free fertilizer falling from the sky, and the birds provide a great deal of entertainment to us as they are quite fun to watch. All we did was make multiple bird houses (huge shoutout to Pappy and his craftmanship! ), place them all along our fenceline, and rotationally graze so that the grass is abundant and our cows and sheep are happy! The swallows did the rest. These sorts of partnerships with nature are so important to recognize and cultivate as they provide multiple benefits for our farm, increase the overall biodiversity and abundance of wildlife, and foster deeper connections with the land we derive our sustenance from. It is a constant reminder to us that when we slow down, listen to the wisdom of the natural world around us and try to understand and emulate its patterns and relationships, we can live in a more beautiful world that has more life and much more connection. We cannot grow food that is nourishing if we abuse the land in the process. When we look out across the road at the end of the day to the monoculture of corn of our farming neighbors it exemplifies this. Whereas our fields and gardens are lit up with a remarkable light show of fireflies flicking on and off in the thousands, there is barren silence and emptiness in those fields across the way where the land has been treated as a means to an end. When there is violence done to the land, violence done to our neighbors and violence done to ourselves, we sever those relationships that provide the capacity for love, relationship and abundance. Nature works by making connections. And as we continue to learn and be in relationship with the rest of the land we live on and each other we hope to see greater diversity, abundance, and joy expressed in these places. I hope the same for the land and people you are in relationship with these next few months. Lots of Food Available for Sale! We have lots of eggs, pork, beef, (a little) lamb, and shiitake mushrooms for sale on the farm, at Lancaster East Side Market, through the Horn Farm, or at one of our drop-off locations in Elizabethtown or Lancaster! Bulk pricing is available if you have the freezer space. Give us a call, email, or stop on in! The newest members of the farm! This duck "disappeared" for a month to sit on eggs in a hidden location on the farm. We never found her until she appeared with this cute little entourage. "La Via Campesina is an international movement bringing together millions of peasants, small and medium size farmers, landless people, rural women and youth, indigenous people, migrants and agricultural workers from around the world. Built on a strong sense of unity, solidarity between these groups, it defends peasant agriculture for food sovereignty as a way to promote social justice and dignity and strongly opposes corporate driven agriculture that destroys social relations and nature." Using a decentralized structure in grass-roots lead movements, "La Via Campesina comprises 182 local and national organisations in 81 countries from Africa, Asia, Europe and the Americas. Altogether it represents about 200 million farmers. It is an autonomous, pluralist, multicultural movement, political in its demand for social justice while being independent from any political party, economic or other type of affiliation." 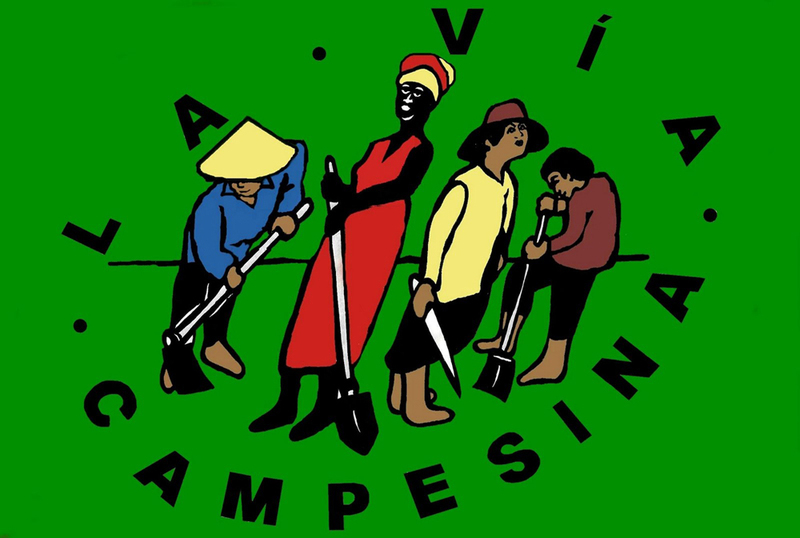 La Via Campesina uses a variety of tactics to meet their three main goals: 1) Defending Food Sovereignty, Struggle for Land, and Agrarian Reforms; 2) Promoting Agroecology and Defending Local Seeds; and 3) Promoting Peasant Rights and Struggle Against Criminalization of Peasants. We at Rising Locust recognize that we directly benefit from the pillars of oppression created by hundreds of years of ongoing settler colonialism. Although we too identify as peasants, we know we're still a part of the ruling class in this country, as well as others that have been colonized through white supremacy. We are doing our best to use our privilege as a tool to shift those structures that will hopefully topple the pillars sooner than later, redistributing the power back to the people. One way to do this is by supporting La Via Campesina's mission. Examples include donating resources to any of their regional organizations, learning about their causes and telling others, or taking part in organizing one of the solidarity events listed on their schedule. Jono herding the "flerd." Summer is the time to move the flerd everyday so that the grass can rest and reinvigorate itself before it is munched on again. This rotation of 30-45 days allows the roots and shoots to regrow dramatically before being grazed again. Each time an area is grazed it receives a healthy dose of cow poop fertilizer that helps build the soil and improve our pasture! 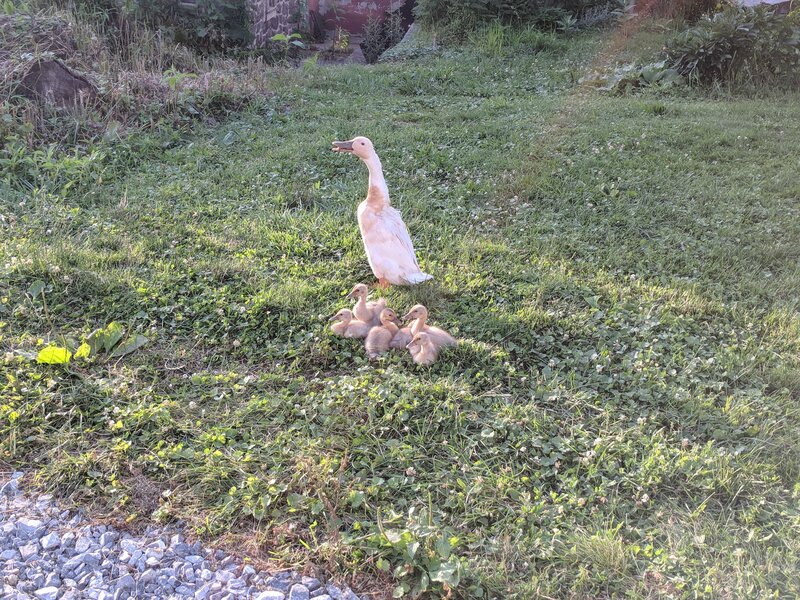 We have been quite busy here at the farm, with lots of garden work, planting trees, shrubs and herbs, tending the mushroom logs, and taking care of animals, including the new arrivals - lambs, chicks, ducklings! We are awaiting the arrival of piglets too - due in early July. 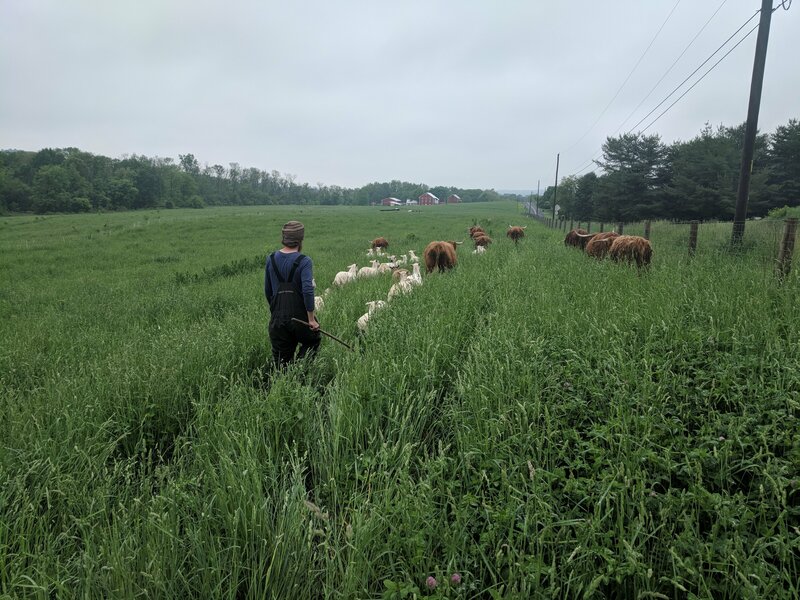 We held an Open Farm Day on May 26, and have several Reading Roundtables, and a Potluck/Movie Night (thanks to Sue and Damon Wagner-Fields for leading a great discussion on the movie The Economics of Happiness!) We will take a break from Reading Roundtables for the summer. Intro to Lacto-fermentation Workshop - Thursday August 2, 6:30-9. Suggested donation: $5-$10 no one turned away for lack of funds. Lacto-fermentation is the ancient art of preserving vegetables using salt. The use of salt inhibits pathogenic bacterial growth and allows only the lactic acid bacteria to thrive, converting the natural sugars of the produce into zingy, tangy, sour, umami! This ain't like those vinegar pickles! This is a very interactive workshop for the newbie fermenter and will begin with priming your palette with SAMPLES of some recent fermentations made by the facilitators while discussing the health benefits of lacto-fermented foods. You will learn both brining and salting techniques to begin making your own pickles, krauts, hot sauces, and kimchis. You will then have the opportunity to make a small-batch ferment of your choosing. You will leave not only with a ferment of your own creation, but enough knowledge and confidence to continue to experiment with fermentation using all kinds of produce at home. Please Register by July 30th, space is limited! Please register by emailing risinglocustfarm@gmail.com so we can have the appropriate amount of produce and other materials for the workshop. Justina Wenger-Pfarr and Donna Volles are two fermentationistas who love to talk food (with food in their mouth! ), nutrition, and ways to create health-conscious comestibles. These ladies aren't afraid to experiment with flavor! Are you interested in setting up your own simple solar system? Or are you just curious about how they work? Join us as Dr. Kurt DeGoede from Elizabethtown College explains the fundamental functionality of PV modules, and Inverters, the use of several great online resources, and batteries/charge controllers for off-grid systems. This will include some hands-on measurement.
" I have seen that community and a close relationship with the land can enrich human life beyond all comparison with material wealth or technological sophistication. I have learned that another way is possible." 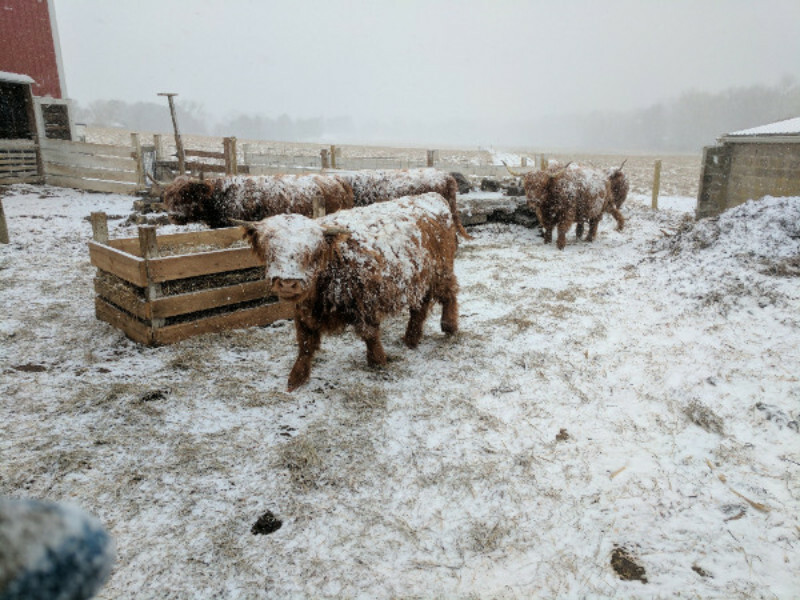 Our relationship with the land here at the farm has been an interesting one this late winter and early spring - each week brings a new weather pattern. We got excited by the early growth of the grass in the pasture, and then the cold weather returned, and the growth slowed. Each day of sunlight and warmth has been a promise of the coming spring, but winter has not been quite ready to give up its grasp. We have moved into a more active pattern of work here, in spite of the fluctuating weather. 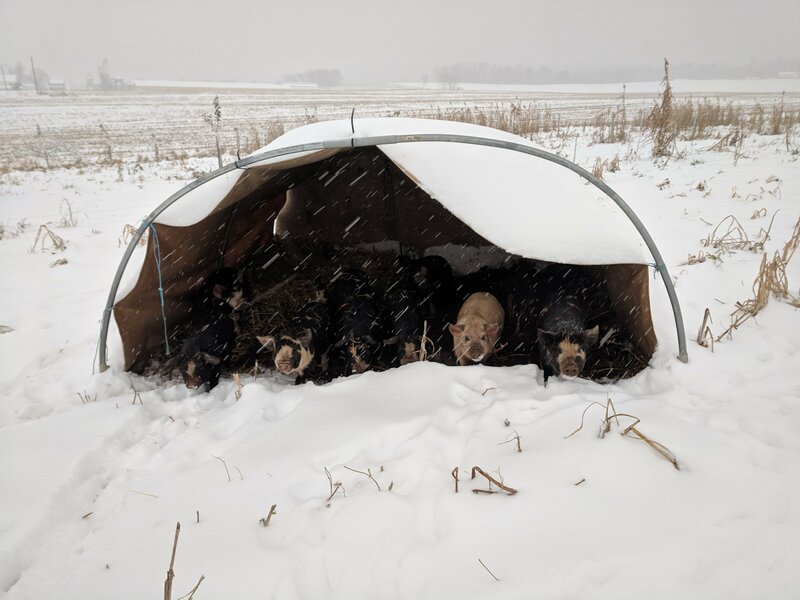 New summer shade and rain shelters for the cows, sheep and pigs are being built as they get ready to move out of their winter quarters in and near the barn. Raspberry plants have been divided and replanted, doubling the size of the beds. Orchard beds have been laid out and mulched with wood chips, ready for planting when the trees arrive. 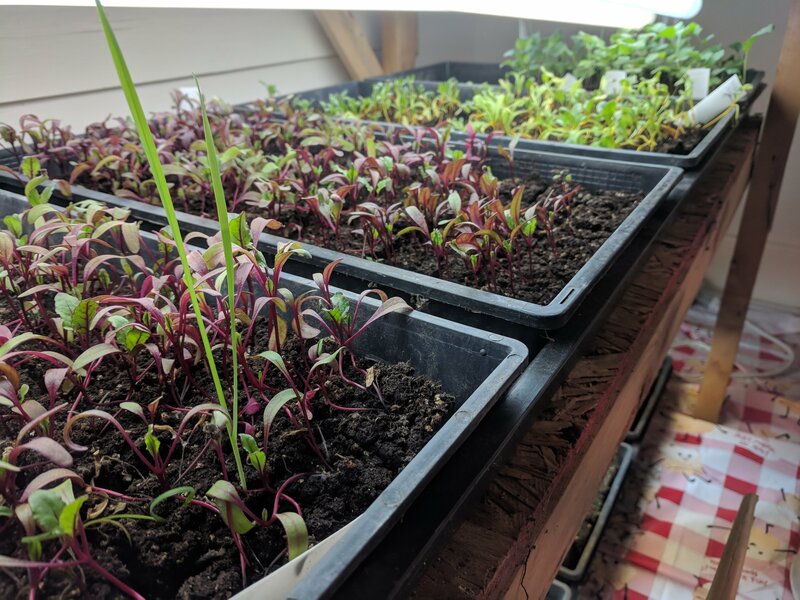 Flats of seeds were started indoors, and some are soon ready to move out to their garden beds. 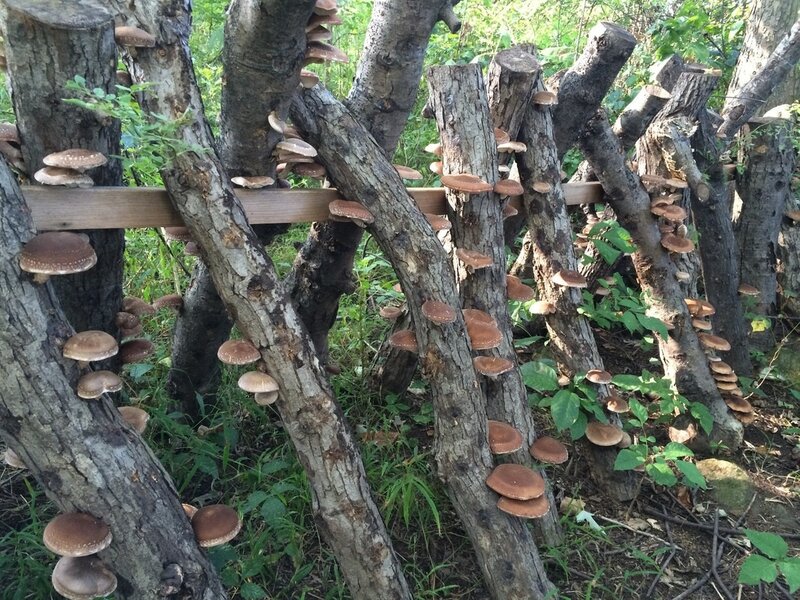 Mushroom logs (400!) were inoculated and are stacked in their new resting places down by the creek. 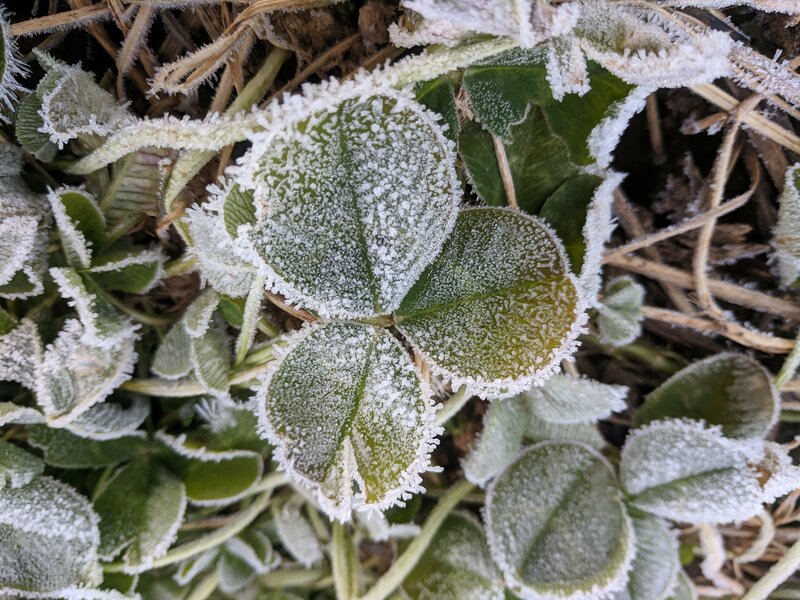 As the trees, plants and animals begin to wake up, so do our bodies, as we shed our winter stiffness and begin to adjust to more physical labor - how good that feels! In the quote above, Helena Norberg-Hodge refers to enriching human life with a close relationship with the land and community. We hope to foster more community by inviting people here more intentionally (we have always been happy to have many visitors). Our upcoming events are listed below and we are glad to hear new ideas of ways to connect to the greater community around us. 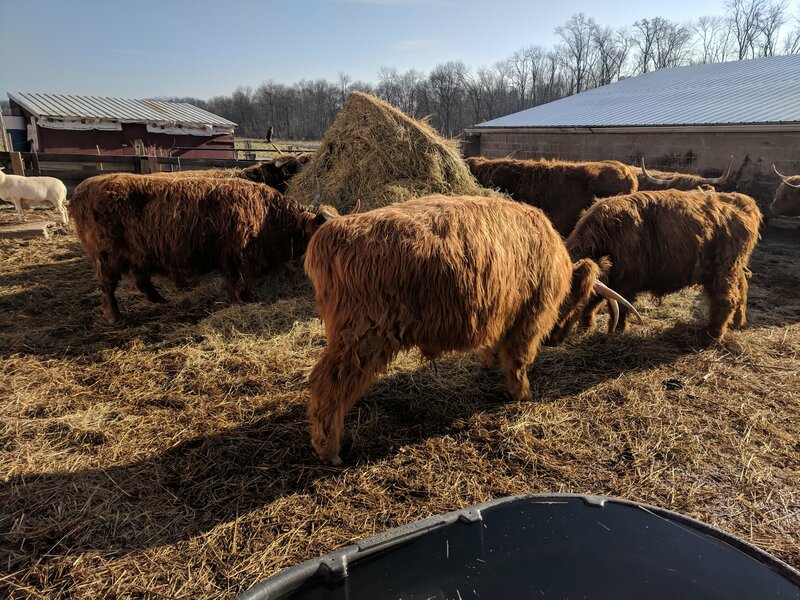 Reserve an 1/8 or 1/4 of 100% grass-fed Highland Beef now! Find prices and info on our website below! We still have pork, lamb, and eggs available in bulk or by the cut. Contact us to order on the website! Sign up for a Pork or Egg Share along with your vegetable share at the Horn Farm Center in York! You can find more info on our website and at the Horn Farm's website. Email or call all pork and egg orders to us. Thanks! - At the Farm - Any day, just let us know your coming! 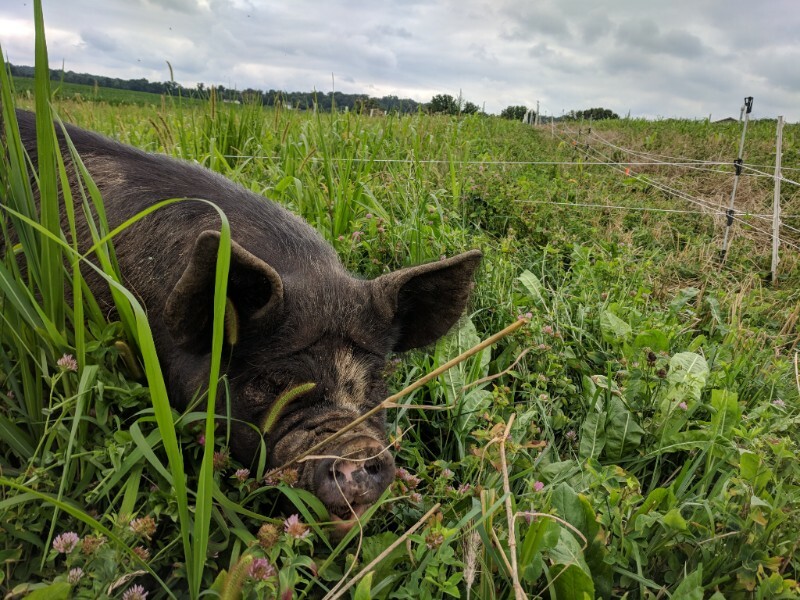 - Horn Farm Center in York (Pork and Egg Shares) - These pork and egg shares will be from May-Oct at the same time as the Horn Farm Center's vegetable CSA. Order now! The Orchard ready to plant! If you haven't noticed by now, we love trees! So far, we have planted over 1200 trees and shrubs on the farm to regenerate our soil, produce food and fodder, sequester carbon, provide habitat, and make our lives that much more beautiful. We can't sing the praises of our woody elders enough! This spring we are planting thousands of trees into two new areas we have not yet cultivated. The first is the 1/2 acre open field next to our house and garden and the the other is the 5 acres across the road we have rented to a neighbor the past few years. 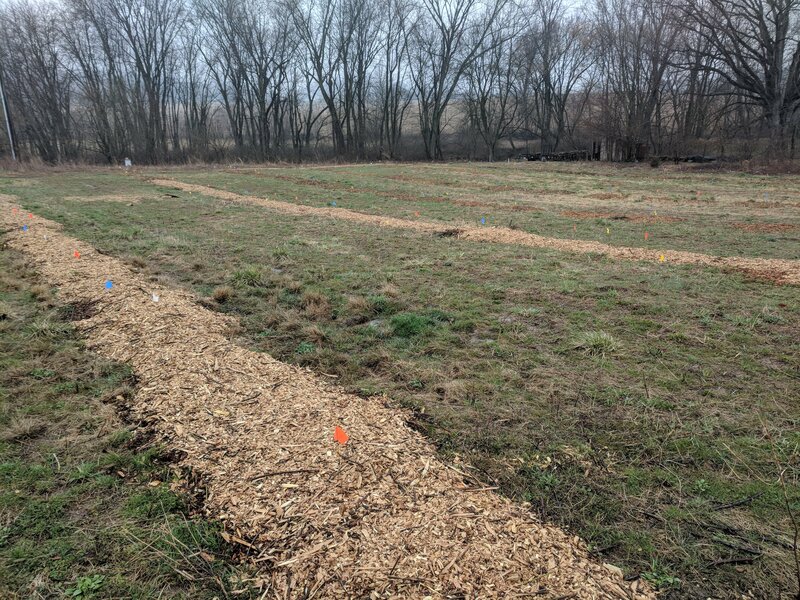 The 1/2 acre plot will be a climate resilient fruit orchard full of apples, persimmons, pawpaw, pears, goji berries, raspberries, asparagus, currants, saskatoon, gooseberries, aronia berries, and seaberries. Beneath all of this diversity will be a wide variety of medicinal herbs, herbs for pollinators, grasses, and clovers. And our resident duck flock will enjoy bounding through the trees, shrubs and herbs eating up orchard pests and slugs while being their whimsical selves. It will be duck heaven! Across the road will be 5 acres of nut trees, fruit trees, and pasture. 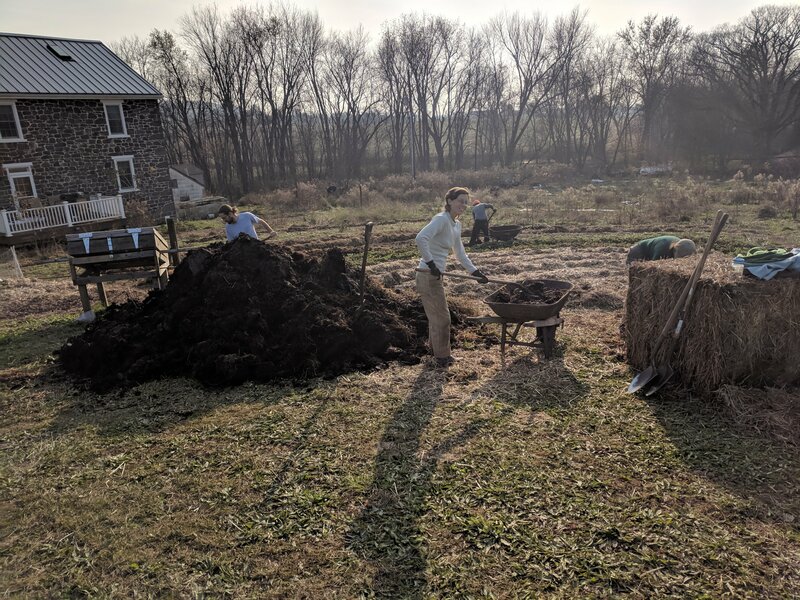 In this system, we are planting blocks of chestnuts, hybrid oaks, hazelnuts, mulberries, native persimmons, and summer apples to provide food for us as well as feed for our hogs and chickens. We will pick all of the fruit and nuts we can sell and eat, with plenty left over. When we are done harvesting, we can run the pigs and chickens through to cleanup all of the delicious leftovers! All of these trees will help us replace our purchased grain feed for our hogs and chickens creating healthier livestock which is more economical to produce! We can't wait to be able to share the bounty of all of these trees and plants in the coming years as they produce and grow more and more food! There are a number of organizations across the US that are advancing the causes of food justice, ecological restoration, and regenerative agriculture. There are also grass-roots lead movements fighting oppression and seeking to shift power all over the globe. Often these are groups led by people of color that do not receive the news, credit, or funding they deserve. As a community committed to furthering regenerative agriculture, permaculture, and right livelihood for people, we want to highlight and share some of these community-focused food and justice organizations with all of you. Here locally our beloved Susquehanna river and Appalachian neighbors have been under attack by unconventional gas exploration (aka fracking) for over a decade. The latest form in this harmful boom and bust economy is the construction of large pipelines to move the fracked gas to the coastal market for export overseas. Currently there are two major pipeline projects cutting through the river valley: the Atlantic Sunrise Project and Sunoco's Mariner East II pipeline. Our farm sits within 5 miles of both lines. Seeing the destruction and out of state work trucks is a daily reality for us. Once these pipelines are built they will allow more drilling to occur within the shale fields furthering ecological and public health degradation. In a recent compendium of studies compiled by Physicians for Social Responsibility, overwhelmingly "more than 80% document risks or actual harms caused by fracking". The negative effects include but are not limited to: increased rates of premature births and infant mortality, cancers, respiratory and cardiovascular diseases, road accidents, worker sudden death episodes, and increased crime rates. The corporations leading these projects have clear-cut intact forests, taken private property by eminent domain, contaminated streams and drinking wells, and divided rural communities while bullying small family farmers into submission. In 2016 the Holleran family lost 90% of their sugar bush, from which they farmed maple syrup in Susquehanna County, to the Constitution Pipeline which was never built. While non-violently defending their home U.S. marshals armed with automatic rifles arrived to assist the workers in felling the sugar maple trees. The Mohn's, organic hay farmers in Conestoga Township in Lancaster County, have filed against Williams Partners for violations against their contract for ignoring safeguards set in place to ensure they maintain their Organic Certification that they've worked many hard years to obtain and keep. In Columbia County, Hearts and Bones Farm, a young family that operates a vegetable CSA outside of Bloomsburg, had to suspend their farming operation for the 2018 season until pipeline construction is complete. 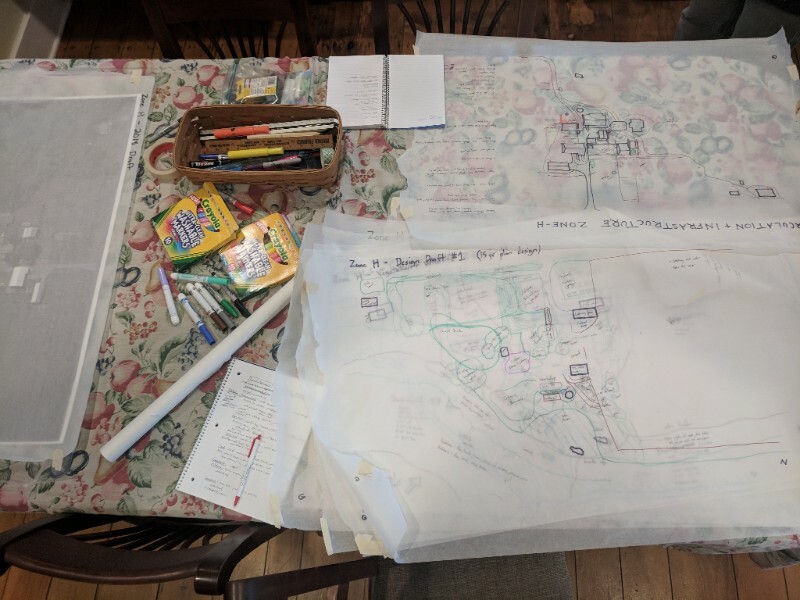 The pipeline will cut straight through their market garden and green house, and trenched across Fishing Creek in their backyard. Once a bucolic setting to raise their children, steward the land, and live the good life, their livelihood has been literally uprooted. All of these farmers had their land seized by eminent domain for corporate profit. 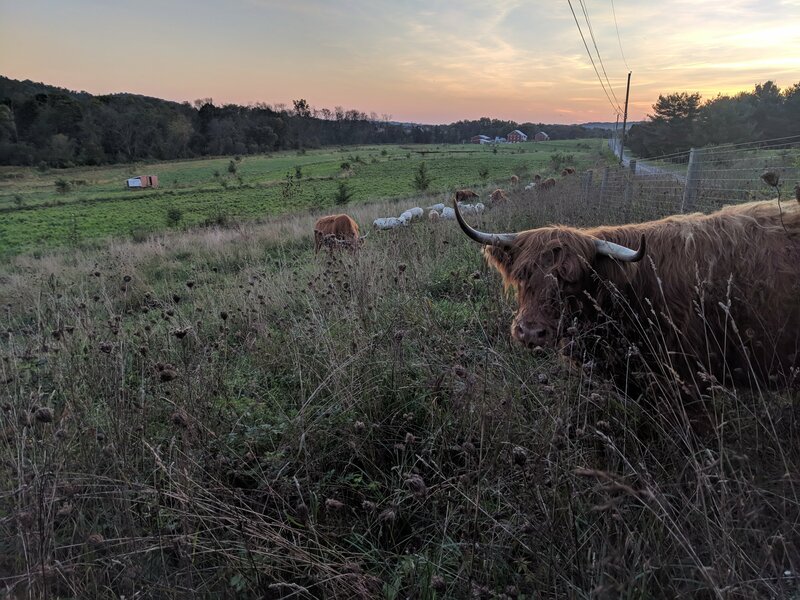 Lancaster Farmland Trust, in a statement read at a rally last year, said the pipeline would "impact the county's farm families and diminish the value of preserved farms in its path". Resistance in the river hills has been empowering, though. An on-going tree-sit in Huntingdon County within the Gerhart family's preserved forest, called Camp White Pine, has been blocking the Mariner East II line for over a year. 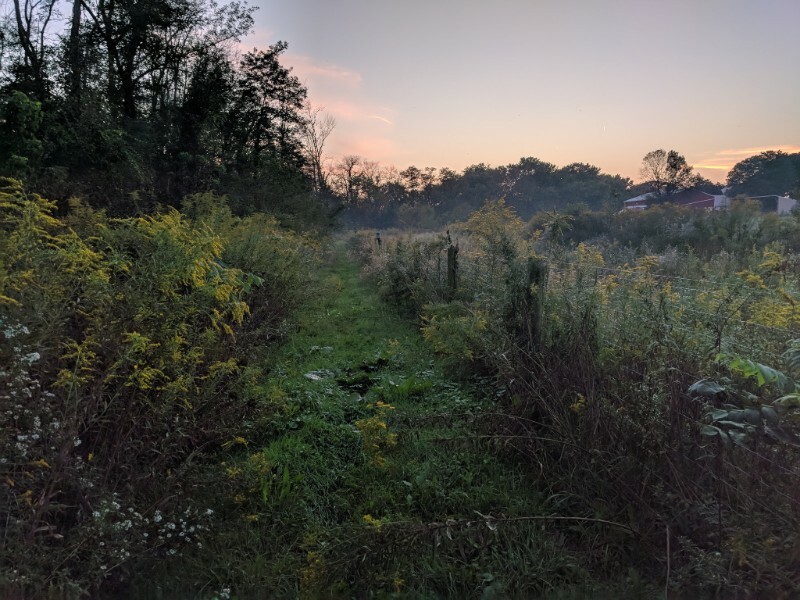 An order of Catholic Nun's in Columbia, PA, the Adorer's of the Blood of Christ, have been hosting non-denominational vigils at a small hand built chapel where the Atlantic Sunrise crosses their property and have filed for an injunction to the federal court to halt operations in accordance with their faith. Lancaster Against Pipelines have been organizing and leading the county in mass participatory non-violent direct action. They've hosted a myriad of training's, speaking events, sit-in's, blockades, demonstrations, an encampment, and organized with CELDF (Community Environmental Legal Defense Fund) attempting to advance the rights of townships and give the power to the people and the land. Although there's been a lot going on, it never seems to be enough when facing a seemingly impossible opponent like multi-national corporations who have so much leverage over the government agencies who are supposed to be regulating them. Fossil fuel pipeline infrastructure isn't just a local issue. The majority of exploitative land grabs are happening to Indigenous peoples, as we can recall the Dakota Sioux having their treaty broken and calling for support at Standing Rock. Currently the Ramapough-Lenape have been maintaining the Split Rock Sweetwater Prayer Camp on their ancestral lands in so-called Mahwah, NJ, along the proposed path of the Pilgrim Pipeline. There are many resistance campaigns like these in North America and around the world working hard to put an end to invasive energy consumption. It is important to act both as hospice for the dying system that's grasping to hold control, and as midwives for the birth of the new dawn. Every one of us has a role to fill right now to defend the land for generations to come. Whether its donating money/supplies, attending a rally, calling Governor Wolf demanding a moratorium, doing door to door canvassing, learning how to monitor workers at job sites, being a legal observer at a direct action protest, or one of the brave folks putting their body on the line, your help is needed. Please take time to check out the links provided, ask yourself what you have to offer, and find out how you can plug in or donate. March was busy here, despite the uncooperative weather and unworkable ground. We had two successful workshops two weekends in a row! Both homemade kombucha brewing and shiitake log inoculation brought familiar and new faces together to learn some homestead-y skills. Rising Locust will continue to facilitate the sharing of knowledge and the cultivation of self-sufficiency amongst each other. Stay tuned for upcoming events, including a cob oven build, bread baking with our friend Deb Santiago, and lacto-fermentation skill-shares. Our monthly Reading Roundtable discussions continue through spring. We begin around 7pm and usually wrap up around 8:30-9pm depending on how deep we get. The following dates and topics have been lined up for the next few months. This short film looks at the link between globalization and climate change, and the effects these have on quality of life around the globe. Not only eye opening, but uplifting, this film demonstrates that a shift towards localization is a feasible way to make greater change. Thanks to our friends Sue and Damon Wagner Fields for the suggestion! We'll kickoff at 5:30 with a potluck followed the film and discussion. Open Farm Days at Rising Locust Farm! Our first will be May 26 - Further details to follow!